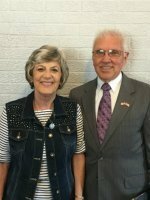 Pastor Wayne and Connie LaForce have served in pastoral ministry in numerous communities. They also served as missionaries for eighteen years. Both Pastor and Connie enjoy getting acquainted with new people. They like to share the Good News of the Gospel. Do you need a friend? They would welcome the opportunity of becoming your friend.